As a red rose remains the popular Valentine's Day gift but the price is pushed higher due to a big demand, many people especially youths are shopping for single roses rather than bouquets. 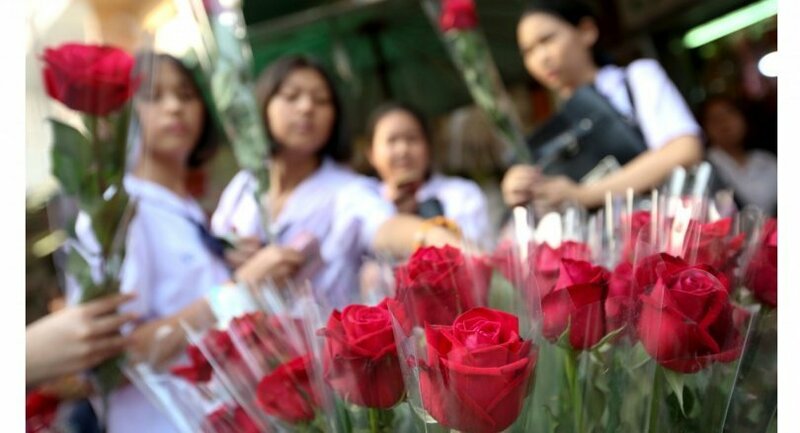 Flower shops in Phayao’s Muang district said they had received fewer orders for rose bouquets compared to the two previous Valentine's Day celebration of love. Having seen a 50 per cent drop in rose bouquet orders, Sasirpreeya Songsi, owner of Sasi Florist Shop in tambon Ban Tom, said suppliers were selling roses at nearly double the price of recent years – for Bt300-Bt350 per set or Bt20 per rose. The jump was due to the expected high demand, said Sasirpreeya, along with the hot, cold and rainy February weather conditions that caused roses to grow slowly and to be less beautiful. Salungtong Florist Shop owner Panu Boontham said the shop received about 100 orders for rose bouquets – a 50 per cent drop from last year – during February 10-13. Although roses were expensive, he would maintain the regular price in order to keep the shop’s standard, Panu said. Vendors at Phayao Arcade Market said they sold roses at Bt10-20 apiece, but were carrying a limited number to sell due to their supplier’s price hike. They would slightly increase the price to Bt20-30 on Valentine's Day itself to ensure no losses, but recognised that people may not be able to buy them if the cost went beyond this range. In Chiang Mai’s Muang district, many people showed up to shop for flowers at Ton Lam Yai Market where vendor Ploenjai Janthaen said red and white roses were most sought after. Individual roses carried a tag of Bt70, compared to last year’s Bt50, while rose bouquets ranged from Bt300-2,000 and special mixed-colour roses fetched Bt150 apiece. In Bangkok, flower vendors at Pak Khlong Talad wholesale market hiked the prices for local roses to Bt30-150 depending on the grade, and for imported roses to Bt300-2,000, with those from the Netherlands, Kenya and Japan carrying higher tags because of their large size and bright colour. The price hike was due to higher costs demanded by suppliers as well as increased transport expenses, they said. Fewer people had showed up to shop for roses this year, possibly due to the economic slowdown, they said. This is by far the most idiotic tradition ever made up, just boycott the garbage, that's what i'm gonna do. I guess you can count the price of a short time from there. Profiteering isn't always the best way to go... they just can't help themselves.. The increase in price has always happened for at least the last 23 years come V-day. Don't understand why this is sensational news. The﻿ jump was due to the expected high demand, said Sasirpreeya, along with the hot, cold and rainy February weather conditions that caused roses to grow slowly and to be less beautiful. No it is not. The jump is due to the profiteering involved, exactly the same happens on Mother's Day, and not just here, but all over the world. Hot, cold, rainy February.......you missed out dry, then you would have covered all weather patterns......Most of these flowers are grown under cover in controlled environments.....They really do think the general public is dim. What do you think you're going to get for one lousy rose?? Everyone goes out of their way to try and show their love in different and unique ways. Yet, out of 365 days in a year, they ALL choose the SAME day to 'profess' their love, and do the SAME things - buy grossly-overpriced flowers and gifts and go to restaurants serving grossly-overpriced, mass-produced set-menus (no, you can't order ala carte today, sir!). No love for 364 days then? I am just curious why, in today's information age, people still falling for this global commercial scam, lining up diligently like drugged animals in a slaughterhouse when, on 'normal' days. a one satang-increase in the price of any items will send them running with their hands in the air crying bloody murder. Love is not a once a year empty commercialised gesture. Vag day has only increased since the introduction of the 1000 baht note if I remember correctly. Sad day for all. At which hospital did you get your sense of humour revomed?